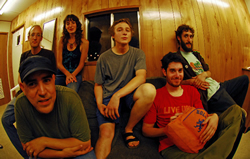 GPGDS played 180 shows in 2008, including performances at Wakarusa, and Mountain Jam. 2007 highlights include a three-week stint in Jamaica, numerous national tours, and a concert at the Metropolitan Museum of Art (NYC). Thanks to their aggressive touring schedule and dynamic sound, Giant Panda has developed an extensive following. Formed in 2004, this Rochester, New York-based group has made a name for themselves through hard work on the road. GPGDS plays an eclectic blend of roots reggae, dub, and afrobeat; their impeccable musicianship and explosive live show have received widespread acclaim. Giant Panda will be releasing a new album in 2009. Their 2006 debut Slow Down, is receiving regular airplay on Sirius and XM Radio. Giant Panda Guerilla Dub Squad has shared the stage with reggae greats Toots And The Maytals, The Wailers, Lee Scratch Perry, Yellowman, Culture, The Meditations, Don Carlos, Morgan Heritage, Mad Professor, and Edi Fitzroy. They’ve been joined on stage by members of Brazilian Girls, Thievery Corporation, and Umphrey’s McGee.